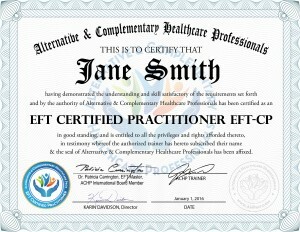 Are you one of the many individuals interested in becoming certified in or learning various wellness techniques to use in your existing practice, or to start a new, exciting career helping others? Or maybe you want to learn a proven self-help technique at your own pace? Have the costs of traveling, certification, finding workshops, and the hassle of taking off from work and time away from your family to travel made it difficult for you to complete– or even start– any training? Have you wondered why certification in your modality or field of interest is nearly non-existent over the internet, when even the largest, most prestigious Universities and colleges around the world are moving toward this format of education? Have you been told that live, in-person training is the only way to get a ‘real’ learning and experience? Reviewing your training and certification options, it’s easy to feel like there are just as many avenues to education and certification as there are people who would benefit from it. And, with each different road to certification, each different modality, each different mentor, certification body, and organization, there comes a new set of hoops to jump through, trainings to locate and travel to, taking time away from your family, job, and personal life, tests to take, fees to pay, and the like. You may find yourself wishing that you could complete the courses you’re interested in and requirements over the internet, from the comfort of your own home and on your own schedule, but perhaps you’ve been told that training over the internet is bogus, or, at the very least, isn’t as good.If this is you– we have some great news. Work from anywhere that has Internet access– home, work, and your local café– ANYWHERE! And more importantly, we’re continuing to build our online training program because it works, and it is often better for you than more traditional routes! When developing our training programs, we knew that we would have to work hard to dispel the myth that online training couldn’t be as good as attending live workshops and events, and to make sure that each and every one of our students received the highest quality in training, hands-on practice, and mentoring along the way. Our programs at Wellness Online Training have done just that– and more.If you want to travel hundreds of miles, pay transportation and hotel costs, and lose a few weekends of your life to add to your skill set, only to be on your own at the end of it, go for it. But, if you’d like to benefit from the highest value in training, resources, and mentorship, we have programs that we know will prepare you for success!